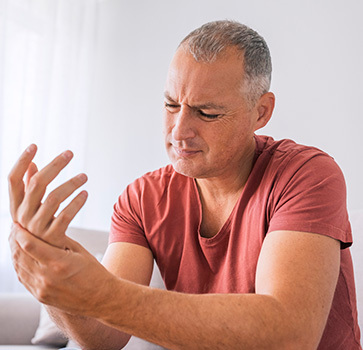 If joint stiffness, pain, swelling, and limited movement are hindering your ability to participate fully in life, come see our highly trained orthopedic surgeon, Dr. Thomas E. Powell, for a comprehensive examination. Our board-certified doctor takes the time to answer your questions and explain your options. If medications, rest, and therapy provide little relief from joint pain, and if you’ve limited your everyday activities, such as walking, stair climbing, and leisure activities, then it may be time to turn to the highly experienced providers at Powell Orthopedics & Sports Medicine for joint replacement. Dr. Powell is an experienced, board-certified orthopedic surgeon in Birmingham, Alabama with expertise in the latest types of hip, knee, and shoulder joint replacement methods, also known as arthroplasty. Are you a candidate for joint replacement? To learn more, request an appointment online or call (205) 877-9191 to schedule an appointment with our joint replacement surgeon in Birmingham, Alabama.